Kudos to those that responded with answers to the last picture – I hope you found it stimulating! Jesse Mumba gets the virtual prize (perhaps a sponsor of real prizes will manifest!) for sending in a complete and thorough answer first. 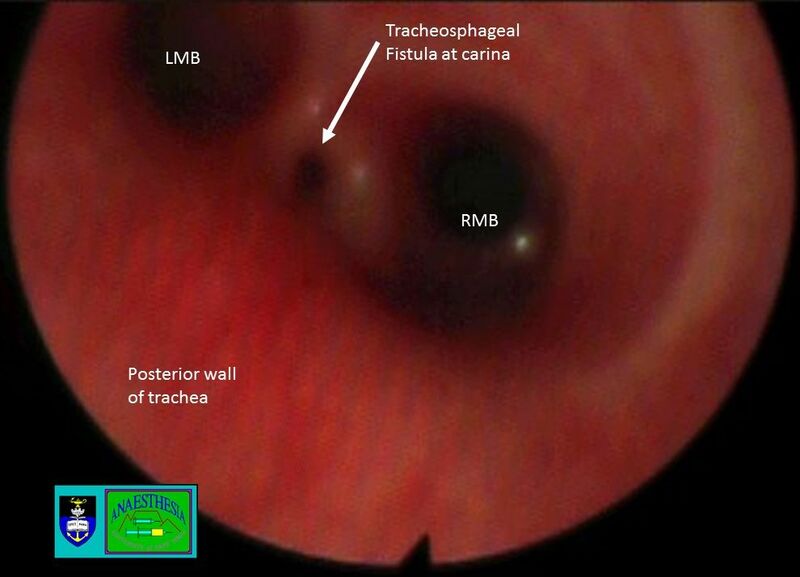 He correctly identified a tracheosophageal fistula on the Gross C (Voit 3B) type, which is the most common (about 86% of cases). To be fair, it could be the much rarer Gross D, which features a proximal fistula with the oesophagus as well, but this is very unlikely. The main anaesthetic challenge (other than surgery in a small neonate with a significant chance of other, including cardiac, abnormalities) is the difficult in providing positive pressure ventilation, as the gas flows preferentially into the stomach via the fistula rather than the lungs. 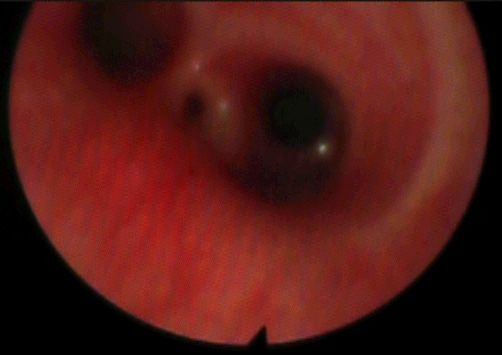 The conventional technique is to maintain spontaneous ventilation through a gas induction until the fistula can be occluded. We achieved this in the above case by passing a Fogarty balloon catheter into the fistula under vision with a 2mm rigid telescope and then intubating with a 2.5mm ETT. Significant simultaneous tachycardia and sympathetic stimulation was noted in the anaesthetic personnel, but the infant did very well. Reproduced from Anaesthesiology online (article and image openly accessible by clicking the image above); credit to the authors, dos Reis Falcão et al. Transorbital intubation! Yip, you read that right. The case report in the September 2014 edition of Anaesthesiology is accessible here and will fill in the details. 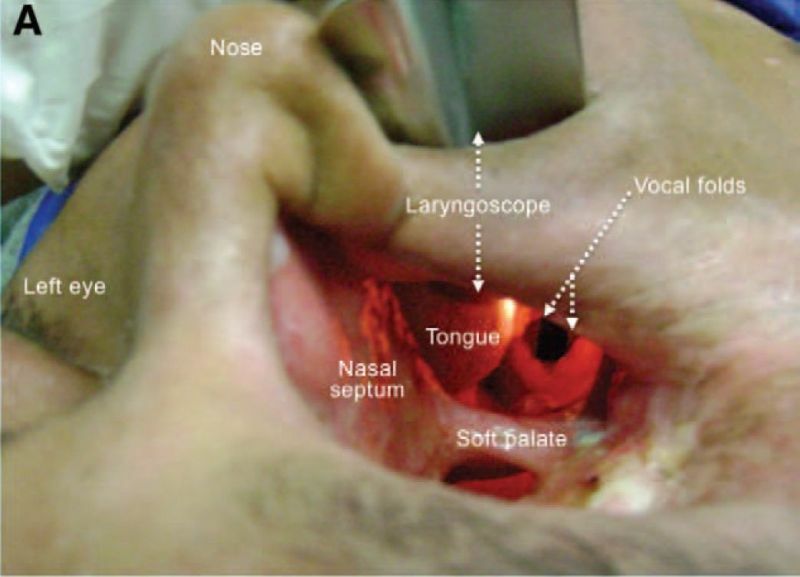 Remarkably, this is not the first time this technique has been described in the literature, although prior reports involved the use of a fibreoptic scope rather than direct laryngoscopy. It goes a long way to illustrate that a good knowledge of the anatomy, technical skill with a wide variety of devices and a flexible approach are the cornerstones of excellence in airway management. Eye can’t beat that this week…nor will anyone else around the globe.